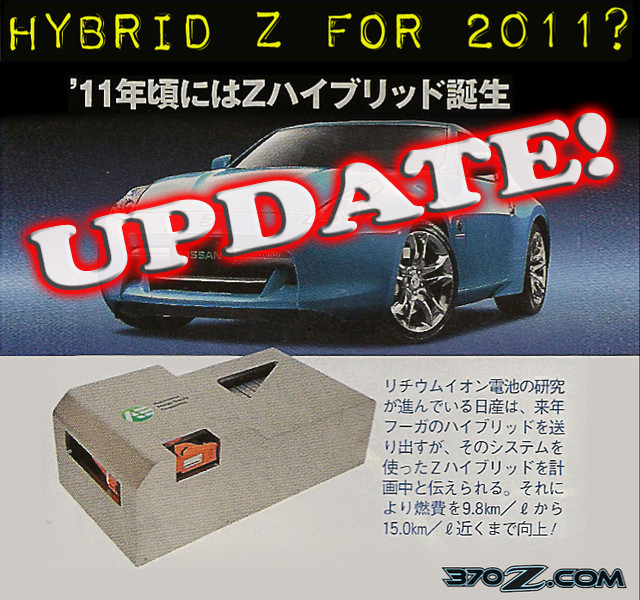 Nissan to Launch Hybrid 370Z sports car in 2011! The Hybrid Nissan 370Z sports car will be powered by this revolutionary Lithium Ion battery pack to be produced by a Nissan-NEC partnership. This battery pack has nearly twice the energy density of the battery packs used by current hybrids. Look carefuly at the front bumper, there is a Hybrid emblem on it. Is it real or is it photoshop? According to Japanese sources, Nissan is working on a Hybrid power system for larger high performance cars and will introduce it on the new Fuga Sedan (our Infiniti M35/M45) which is due in the 2009 as a 2010 model. This hybrid system will be offered in the new Fuga one year after its launch as a 2011 model. Nissan is also planning to use this system for a hybrid version of the 370Z sports car a little later in 2011. This will make the 370Z the first high performance hybrid sports car on the market. Infinti is also looking to enter the hybrid sports car market with a car called the Essence which is currently a concept car. No longer content to use a borrowed system adopted from Toyota as in the hybrid Altima, Nissan has been hard at work to develop its own system to leapfrog Toyota's technology. The Nissan 370Z hybrid will probably be powered by a high tech version of the VQ37VHR engine displacing 3.7 liters with direct injection, CVTC control of both the intake and exhaust cams and VVEL of the intake cam combined with a new super efficient electric motor. It is rumored that the hybrid drive system will use two separate clutches, one between the internal combustion engine and the electric motor with another clutch between the electric motor and the drive wheels. This system will optimize performance and efficiency depending on operating conditions. The new hybrid system will also feature a full plug in EV mode for city type conditions where charging stations are available to maximize economy. The transmission is allegedly a modified version of the 370Z's seven speed automatic transmission with an electric motor in the position where the torque converter currently resides. One electronically controlled clutch is located behind the electric motor and another in front of it allowing the VQ engine to run coupled to the electric motor or decoupled with the car running purely on electrical power. The revolutionary electric motor that could help power the hybrid 370Z is called the 3D motor. 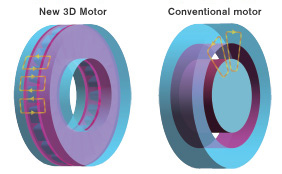 The 3D motor is developed by a joint effort by Nissan and Fujitsu General. It is a slim disk shaped motor that has twice the torque of a conventional motor the same size and weight. The motor gets its name from Nissan's 3D analysis of the magnetic fields of the configuration which enabled optimized placement of the electromagnetic coils and permanent magnets in the periphery around the armature. The electric motors disk-like layout makes the torque converter replacement layout very logical. The possible ability to run the electric motor in series with the internal combustion engine means that this platform has some serious potential for outstanding straight line performance despite the fact that the batteries might add several hundred pounds to the weight of the car. The reason is that electric motors can make 100% of their torque from a standstill. The potential ability for the hybrid controls to add the electric motors estimated 100 lb/ft of torque instantly at any desired point of the powerband to the already potent output of the VQ37VHR is like adding an instant turbo or shot of Nitrous. Some versions of the 3D motor have already pumped out 280 hp and 390 lb/ft of torque. Hopefully Nissan engineers will program the system to allow this sort of potential for sprints at the least. If too much fun depletes the battery, the car will still be fully functional on the big VQ engine. The Infiniti Essence Consept car reportedly gets almost 600 hp from its similar hybrid system although the VQ engine used in that car has twin turbos from the Skyline GTR grafted to its direct injection cylinder heads. Based on this, we think that a conservative estimate of 400 hp is possible for a hybrid 370Z. If the hybrid system adds another 300 lbs to the 370Z's curb weight, you would still have a car that is about the same weight of the highly regarded Z32 300ZXTT with about 100 more hp and a better chassis and brakes! The hybrid 370Z would still be much lighter than the R35 Skyline GT-R. The Hybrid 370Z will probably run on a compact, trunk mounted lithium ion battery pack built by a joint venture between Nissan and electronics giant NEC that has twice the energy density of conventional batteries such as the nickel metal hydride batteries found in most current hybrids. The new battery has a laminated construction which has more internal surface area of the storage grids. A similar drive system is rumored to be in development for a possible Toyota Supra Replacement as well. Considering Toyota's experience with hybrid technology in front engine rear drive vehicles, from Lexus to even race cars, this sounds plausible. Currently, Techtom, a Japanese aftermarket electronics tuner has had some interesting and promising results tinkering with the hybrid drive system on a Prius, enabling much more aggressive application of power from both the electric and Internal combustion powerplants at once, waking up much more performance for this unexpected platform. With The Obama administrations new stringent CAFE standards on the horizon, this sort of electronic tuning may be our high performance future! The new hybrid 370Z sports car is projected to have remarkably high fuel economy; an average of 35 mpg in mixed cycle use vs. the current average of about 23 mpg. We eagerly await the Hybrid 370Z. This might be a vehicle where you can have your cake and eat it too: fast, green and economical. Stay tuned to 370Z.com for more developments. What do you think? Would you want a hybrid 370Z? What sort of features would you want? What sorts of compromises between green economy and performance would you expect? Discuss here on our forum!